In episode 6 of The Predictive Marketer we’re joined by Tom Gatten. Tom is the Founder and CEO of GrowthIntel, a London-based firm using machine learning and data science to do predictive marketing. Tom is a thought leader in the predictive marketing space and in demand as an advocate of using new technology to power business and economic growth. For complete transcription, click here. [In episode 6 of The Predictive Marketer we’re joined by Tom Gatten. 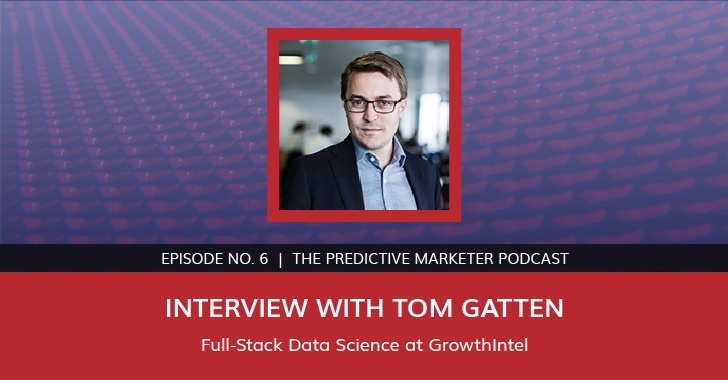 Tom is the Founder and CEO of GrowthIntel, a London-based firm using machine learning and data science to do predictive marketing. Tom is a thought leader in the predictive marketing space and in demand as an advocate of using new technology to power business and economic growth. Tom: I started out as a journalist after university. So I went straight into the BBC World service which is radio, international radio. We would make programs that people all over the world had to be interested in. So it's a very interesting job. And it also involved, coincidentally, quite a lot of cold calling. So I would call up scientists, politicians and people all over the world and say, “I'm calling for BBC. I’d like to interview you.” And you’ve got an amazing brand of BBC, so you get to speak to a lot of interesting people. So I did that briefly. And then I went to work for the Times of India, it's a newspaper in India. And I came back to this country to work for business intelligence company called IHS which is big American multinational BI firm. And it's quite a traditional company; it specializes in oil and gas and heavy industry publications. The part that I was working for was called Screen Digest and they were providing information on trends in digital contents. So it's actually quite a forward looking part of the business but it's still a very traditional company. And one day, Google came to them and said, “How much money is Groupon making today?” And the company I was working for said, “Well, we don't know. They're a private company. They're a private company in the States; they're a private company in Europe. We just don't know. If you came back in three years’ time, they'll file something with the business registries in Europe and we'll be able to say something about them.” But that wasn't good enough. This was late 2010 and Google wanted to know how much money they're making because they were looking to make an offer to acquire them. And I thought that's very interesting. The company I was working for was very, very traditional; we were doing a lot of manual research online using very traditional sources. You know, the company's housed in Europe and Dun & Bradstreet in the US. And I thought that's totally different. That's a new way of looking at things. They were able to use real time data from the web to say something interesting about the growth of a business. So I left the company and started a magazine called Startup Intelligence. And the idea was we would provide reports, you know, the top twenty five most exciting machine to machine communication startups in Turkey or Mexico or South East Asia. And we had one major client for the first couple of years, it was IBM, we worked with Google a bit, we worked for Tech City, so UK government but the main client was IBM. And they’d say, “Here's fifty companies we've partnered with, sold to, in the US. Find us another twenty five in Turkey that look like this.” And I would sit down (and it was just me those days) I would sit down, look through all these companies, look through all their websites, look through all the news articles, read everything there was about them online, I’d look at Alexa, I’d look at Twitter, I’d look at their LinkedIn profiles of the people that worked there. I’d interview the CEOs and then I’d kind of draw conclusions about what it was that linked these companies. And for IBM, at the time, they were really, really interested in smart cities and the internet of things. So the common denominator turned out to be companies that were three to five software engineers making half a million in revenue but not much more in using sensor networks, big data, internet of things in the context of transporter energy logistics because that's what IBM’s really, really interested in, particularly, if they had an organic-inorganic interaction. So I've found that they really liked when companies had this kind of charismatic element. So for example, I remember we found a small company in Russia; it was a spin out of a university I hadn’t even incorporated yet and this guy was going to make a company building an audio Breathalyzer. So basically, this machine plugs on to the front of the door of the coal mine and the Russian mine. It goes up and it counts to ten in Russian and it will lock the door if he's too drunk to go down the coal mine. So we had great fun seeing if we could set it off downloading a piece of software and trying to see if we could sound like a drunk Russian coal miner. So that was great fun. There was this company in Southeast Asia that was using the physiology of fish to work out quality of water because they have various species of fish that were susceptible to different contaminants in the water. Then they have a camera over the top of each tank to see how many fish had died whilst the water was flowing through. There was a company that was making a system that basically had a hand held detector for explosives with a bee, like a live bee in the center of this hand held device, and it would train the bee to recognize the smell of explosives and then it had a little camera to watch which way its ‘body parts’ went and whether it was extended or not. I mean, very cool companies. But we would do this all manually. So at that time, I started realizing that IBM were using it for marketing. So whilst I thought they were going to use it to invest in these companies (and sometimes they did) a lot of the time, they would go and I would give them this report. I would very carefully write up this report with lots and lots of interviews, photos of the founders, all sorts of things, this report in twenty five companies. And I'm able to totally ignore the report and flip right at the back page where I had the list of the companies I had spoken to and the phone numbers of the CEOs. And I’d call them up and I’d sell them DB2 instances. So I realized that what I was actually doing was very expensive lead generation for IBM. And I said to him, “What I'm doing is a bit like that.” Just a bit of a forced analogy but basically I said, “We're listening into the sound that companies make in the world in the data sphere and we're trying to imply… you know, we're trying to predict their behavior, we're trying to predict something about whether they are going to DB2 instance. And what you're doing is listening to the sounds that these submarines are making and using the faint signals that you can pull out of the noise to predict something about them. So maybe we can use machines to do what I'm doing with my brain.” And that's basically what we do. So companies come along and give us a set of companies that they’ve attempted to market to in the past. And they say, “Here's all the companies we tried last year.” It's 250,000 SMEs, name of company, date, outcome of the call or the email or whatever it is. And our system then looks back in time to see what were the patterns of signals that those companies were exhibiting at the time they said yes or no. And then they're able to use growth intelligence to find other companies that are exhibiting the good patterns today. Basically, it just makes them more efficient in their marketing because they can use a statistical approach to predict which ones are more or less likely to respond. Steve: So when you started GrowthIntel four years ago, predictive marketing was essentially an open canvas; there were no other companies, per say, there were no use cases. Tell us what it was like to be a pioneer in the predictive marketing industry when you started GrowthIntel. Tom: When I first started out the company, no one had any idea what a predictive marketing piece of software was supposed to do or what it's supposed to look like. I think now, I think it's clear that all of the companies in our space, it's starting to become more mature, people are starting to know roughly what to expect from the space. But yeah, when I started, we were setting out to solve related but different problems. So there's early days when I was writing reports manually for IBM. The problem was I want to find a relatively small number of very well qualified companies which I can invite to an event and you know, give an award to and eventually that will buy IBM kit. And then when they're a massive company, you know, we need to predict the winners of the futures so that when the internet of things takes over the world, it will be running on IBM, IBM infrastructure. So that's a different problem. It's a subtly different problem from the one we solve today, although it is very much related. I mean, for a long time, in 2013 we thought that we would be primarily used by financial services companies. We actually won a Fintech competition called the Fintech Innovation Lab sponsored by Accenture. Our office space was paid for by Goldman Sachs and JPMorgan for about six months. And at the end of that six months, I think we realized that, you know, we couldn’t really, in all honesty, call ourselves a financial services or Fintech company because most of our clients came from… a lot of them came from financial services areas in those days but you know, we also had clients in logistics and technology and a variety of different industries. Steve: Interesting. You touched on it briefly, but what is the target market that GrowthIntel is pursuing? Tom: So we're going after companies that are targeting small businesses at scale; so any company that's doing high-volume marketing. So a typical example of this would be, well, let’s think of someone like Box or Dropbox; they're targeting a large number of very small businesses at scale. So some of their money will come from enterprise deals, but a lot of the money comes from the small businesses. And companies like these will have variety of different channels; they’ll use online, they’ll use online advertising, they’ll use telemarketing, they’ll use channel partners, sometimes they'll use direct mail. And in general, these outbound channels have got relatively poor results. So the kind of accepted industry average for years and years from telemarketing was about one percent; for direct mails, it's about half a percent. And there are inbound channels which have a much higher conversion rates once you’ve captured the lead, but they're very expensive to develop and they're not scalable. So where you're fast growing business relying solely on an inbound model and you know, you're getting challenges from your boss to grow at 30%, 40%, 50% a year, with an inbound model, you can only target companies within your, I call a “content sphere.” so you can only target companies that are likely to receive content that you're distributing. But very commonly, you'll want to go outside that and address a larger proportion of your total addressable market. And that's why you'll rely on the outbound channels: the telemarketing, the direct mail, which have the opposite problem; they're very scalable but very low success rate because the traditional model would be to go to Dun & Bradstreet, Experian, a traditional credit analysis provider or list provider; you buy lists and you call through the lists. It was highly inefficient. Companies that are in that space, that's the challenge that we are addressing. Steve: Let’s talk about the data sets that you work with. Tom: I think GrowthIntelligence is quite unique in that we do full stack data science. So we go and rather than aggregating APIs from other providers of raw information, we build… I mean probably this is partly because of our geography. In Europe, there aren’t providers of the sort of information at scale. Like for example, there's a company called HG Data in the States which provides lots and lots of information about the installed technologies at companies all over the US but their coverage in Europe is not so good. And there's many, many examples of this. So we've been forced by circumstance to go and source data ourselves from raw, unstructured data. But it's also provided us with, you know, quite a deep grounding in that kind of data science. So by full-stack data science, I mean that our developers here are using primary sources. So rather than aggregating data sets that already exist in structured form, we go out and we crawl millions of websites, millions of businesses all over the world. And we go and get information from job ads, raw text, which is uninterpreted, using machine learning to create what we call “signals” which are kind of higher order pieces of information. And it's those higher order pieces of information that our machine learning system which then predicts which business are more or less likely to convert, works on. So that's quite unique. Steve: Yes, I would agree. That is very powerful. 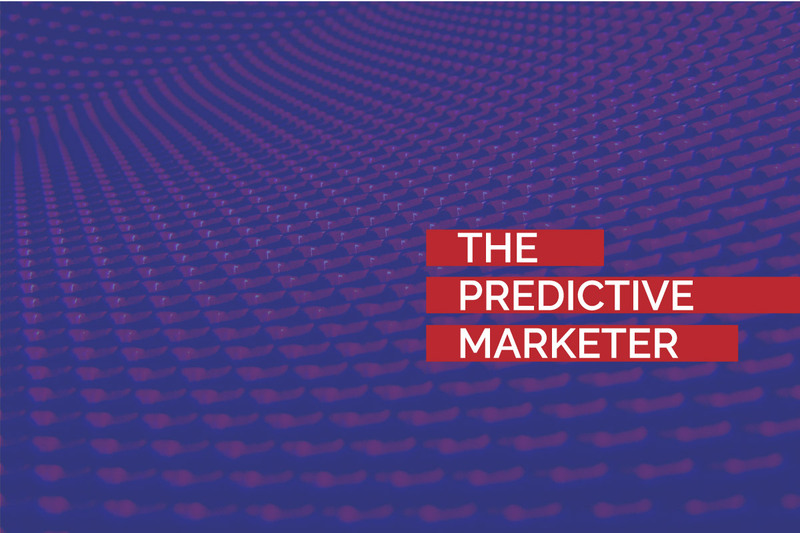 How would you characterize the predictive marketing function that GrowthIntel provides? How does it relate to all of the other functions in sales and marketing? Tom: It's like a brain that sits in the center of your marketing sales operations. Think of it… if you imagine a typical, large, high-volume B2B business; you'll be spending, you know, five, ten, fifteen million pounds in your sales and marketing function a year. You're going to have a CRM, you're going to have a marketing automation system, you're going to have an inside sales, you're going to have a field sales team, you might have an outsourced telemarketing team and you might have a digital marketing team. And all of those elements are working from traditionally, rather poor quality market data. So as marketer in previous years, you would have to … you know, you can link your CRM to your marketing automation system, you can link the work of your telemarketers to your sales people, but you're guiding the whole machinery from an understanding of the economy which is fundamentally flawed. For example, if you used a Dun & Bradstreet based understanding of the economy, you're going to be relying on North American Industry Classification Code (NAICS) codes or Standard Industry Classification Code (SIC) codes and historical financial filings to get a segmentation of the economy. So to know, even the basics of you know, “how many companies can I target and which order am I going to go after them in?” you're relying on that sort of information. And the problem with that sort of information, NAICS codes are much better than SIC codes. And I mentioned how they're before and how it was actually involved in the development of NAICS codes. They're much better than their predecessor but the system itself was invented in 1948 and has been updated six times since then. You know, companies can only have one classification system. Companies self-classify themselves. It's a one dimensional system and it doesn’t describe whole areas of the economy. In Europe, a third of businesses simply don't have an SIC code. I mean, so our industry classification code in the traditional databases, other business services is not elsewhere classified, which is totally not useful; if you're a business who wants to go and target you know, technology companies, you'll be missing out on a third of them from the get go. And what would you do if you want to target companies that are developing software for the oil and gas industry; do you go after the NAICS code for oil and gas or do you go after the NAICS code for software? You can’t go after both. And if you're relying on it for the size of the business, their historical financial filings, you'd be working on data that has just… it's just very poorly populated. So I think of GrowthIntel like a brain that sits… if you imagine you know, the CRM is the arm of the robot, the marketing automation system is the other arm of the robot, the sales team is the body of the robot, inside sales team is one leg and the telemarketing team is the other leg and all of these is kind of lumbering around on you know, rather poor intelligence, GrowthIntelligence like a brain that sits in the center of this and coordinates everything. So it looks out to the wide world of all the businesses. We have a system which has a record of every single potential buyer in the entire economy. We believe we're the first non-governmental organization ever to attempt an understanding of the structure of an entire economy. So our system has a basis of understanding of every single potential buyer and then providing predictive power throughout your marketing and sales pipeline to keep all of those elements aligned. Steve: Yeah, that's fascinating. So you're working with companies worldwide, is that correct? Tom: Yes. Although we're only helping them sell into Europe. Tom: We work with American companies, we work with companies all over the world, but it's to help them sell into Europe right now. Steve: Very good. So how do you see predictive analytics and predictive marketing unfolding as we go forward? What does it mean for marketers? Tom: Well, this is such an exciting space because it's such an exciting space to work in because you know, we are all kind of standing in the shallow end of the pool very much. You know, we are only scratching the surface of what's possible here. I mean, the way I see this going from a business perspective is that all businesses will have an understanding of every potential buyer that they could have anywhere in the world and a numerical representation with a known error of how likely each one of them is to respond positively to their marketing. So I sort of see this as a kind of a predictive supply network for the entire economy. If you imagine every business could know all of their potential clients and how likely they were to convert. Actually, what a difference that would make to global trade. Trade is a vitally important part of human civilization; without it, we wouldn’t be able to build spaceships, we wouldn’t be able to build buildings. Trade is a fundamental human characteristic. And by realizing the potential of trade in the world, we can actually, to a large degree, realize the potential of civilization. That’s quite a big vision but you know, predictive marketing could get a long way towards you know, boosting growth for companies all around the world and even to the growth of economies. Steve: That's an amazing perspective. What's on the horizon for GrowthIntel in 2016? Tom: We've grown very fast this year. We're very lucky to have a fantastic world leading group of investors and advisors. And we've grown our team… we've probably quadrupled in size this year, I think. So next year, we're going to be working with a wider variety of different types of businesses. So far, we've stopped… I mean, UK is a leader in financial services, so it was sort of inevitable that we would start with financial services. And we've worked with banks and non-bank financial services provider of many different kinds, particularly SME lending. And this year, we've spent a lot of time working with logistics companies and website technology companies. So our growth over the next year would be into many different types of business, so we're targeting insurance companies, brokers, a wide variety of technology, technology companies, equipment companies, office furniture, all sorts of different types of businesses that we're going to be able to work with next year. We're still going to stick to working with the very largest businesses in the economy. So we aim to work with the top three leaders in each space and we don't intend to spend too much going time trying to work with companies that are sort of four, five and six down from the market leader. So we're going to continue to expand our coverage, which is really true 100% coverage of every single business in the economy. And to other parts of Europe we haven't covered yet and into the States. So we'll be looking to work with companies selling into United States next year in 2016 as well. Steve: Sounds like an amazing year ahead for sure. Tom, thank you so much for taking the time to be with us today. Tom: Awesome, Steve! It's been really great to speak to you. Thank you so much for instigating this.